Johnny's has everything you need to grow your own plants from seed. Save 10 percent on seed-starting supplies now through Feb. 28, 2011. Visit the website for details. Whether you have a greenhouse, a cold frame, or grow lights on a shelf, you can take advantage of professional seed-starting supplies. Plug flats and seedling trays in the most popular sizes for veggies, herbs, and flowers. Biodegradable (plantable) containers in various sizes for your own use or for plant sales. Soil block makers and mix for air-pruned transplants. Heat mats, domes, and grow lights for getting plants off to a healthy start despite the cold. Organic growing mixes and fertilizers. Sprouts are a super-quick crop to grow for winter markets and your own healthy meals. 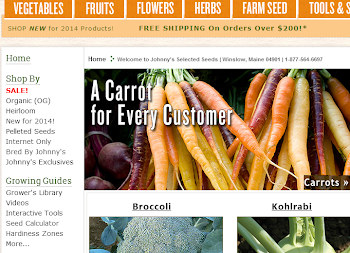 Johnny's has a dozen varieties of sprouting seed, most of them certified organic. All Johnny's sprouting seeds are untreated and have tested negative for E. coli 0157 and Salmonella. For personal use, try the convenient Bioset Kitchen Salad Garden. At just $20.95, it provides an inexpensive way to have fresh greens for your table all winter. The Bioset has three stacking trays so you can grow three varieties at one time. Place sprouting seeds in each tray, fill the top tray with water twice a day, and leave the Bioset on your kitchen counter at room temperature. The Bioset's unique siphon action perfectly controls moisture and humidity. Sprouts grow straight up without tangling, and are ready to eat in 3-10 days, depending on variety and temperature. Sprouts are high in vitamins and phytochemicals, and each variety has its own unique flavor. For example, broccoli sprouts, which have a mildly spicy taste, have been shown to reduce the risk of breast and colon cancer, stomach ulcers, stroke, high blood pressure, and cardiovascular disease. Mung bean sprouts have a mild flavor and impart a pleasant crunch to foods, plus they are high in Vitamin C and are a good source of protein. Alphalfa sprouts have a mild, nutty flavor, and a host of different uses. 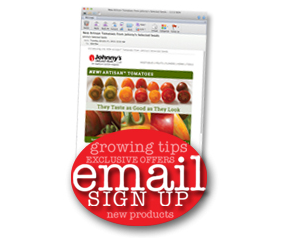 Johnny's has complete instructions for sprouting seeds, either in jars or in the Bioset. For more information, read our tech sheet on sprouting. Long popular in Europe, celeriac is finally winning fans in North America, especially among locavores and chefs who specialize in seasonal cuisines. Though rough and warty on the outside, celeriac roots when peeled have a crisp white flesh similar in flavor to celery. Like other root crops, it is perfect for winter soups and stews or it can be roasted, boiled and mashed, or even french-fried like potatoes. It also makes a nice fresh salad when grated. Among its virtues is its ability to store for months when held at 35˚F/1.7˚C and high humidity. It is a long crop, 100 days to maturity, so it needs to be started in late winter or early spring, 10-12 weeks before transplanting outdoors. It is grown like celery, which means it requires steady moisture and gradually warming weather. Exposure of young plants to temperatures below 55°F/13˚C for 10 days may cause the plants to bolt. Mars is a new organic variety this year, and it is very similar to our standard variety Brilliant. Corinto is a slicing cucumber that is a good choice for growing in a greenhouse or hoophouse because it is parthenocarpic, which means it does not require pollination. Corinto also performs well in the open field for the same reason in case the cucumbers start to set while still covered with floating row cover, or in prolonged period of cool or cloudy weather when bees are not flying.Just 48 days to maturity, this cucumber produces smooth, slender, 7-8" dark green fruits with very small seed cavities. Skin is thinner than the average slicer. What's more, it's resistant to powdery mildew, cucumber mosaic virus, and cucumber vein yellowing virus. Adam Gherkin is a new organic pickler, that is also parthenocarpic. It produces high yields of cucumbers that are nicely proportioned even when very small (2-3" long). Aptly named, Adam Gherkin is one of the preferred varieties for making tiny gherkin pickles. Dark green skin, good flavor, and 50 days to maturity. Pollenless, single-stem sunflowers are one of the most popular cut flower crops, and Zohar is a new variety available as Organic seed. Zohar presents a classic sunflower appearance, with dark gold (sometimes called orange) petals and a dark brown center. It is similar to Pro Cut Orange in color, shape, and days to maturity (50-60). Zohar reaches 48-60" tall and has strong stems. Plants bloom at the same time, so steady production can be scheduled with multiple sowings all season. Giant of Italy, our most popular flat-leaf parsley, is now available as Organic seed. Giant of Italy has big, dark green leaves and upright stems so it stays clean. Very high yielding and one of the best herbs for fresh market sales. Rhubarb is commonly thought of as a perennial crop that is expensive to establish and suitable only for the north. Seed-grown rhubarb overcomes both those problems! Seed is inexpensive and easy to grow. And Southern gardeners can start rhubarb in the fall and overwinter it, treating it as an annual and discarding the plants after harvest in early spring. Rhubarb seed germinates readily and grows quickly. It should be started 5-7 weeks before the last frost date. The big, papery seeds should be soaked for two hours before planting, and they should be planted in individual pots. Cow Pots or DotPots are ideal, especially for plant sales in spring. The seedlings are frost tender, so wait until danger of frost has passed before planting them outside. New this year, Johnny's has added Organic Victoria rhubarb seed in addition to Organic Victoria plants. For more on growing rhubarb as an annual in the South, read this article in Texas Gardener magazine. Johnny's has five new offerings this year to help you expand your food production. Prime Jim blackberry is an everbearing variety that is hardy to Zone 4. The plants are not as thorny as wild blackberries and the flavor is deliciously sweet. Fruiting begins in late summer, around Labor Day in New England. We recommend trialing this new variety, especially in the North, to determine if you will get sufficient yield before your first frost. Stevens cranberry has replaced our previous variety, Howes, because it has better flavor and higher yields. A product of USDA's Cranberry Breeding Program, Stevens has round-oval fruits with very good keeping quality. We ship 4-year-old plants from mid April through mid June and again from early August through September. New grape varieties include two new wine grapes, Marechal Foch and Brianna, plus a collection of three seedless table grapes.